It was not Beavis and Butthead, but Bill and Ted who once said there was something strange afoot at the Circle K. I'm enjoying the return of Beavis and Butthead on MTV, mostly because Mike Judge is in fine form and the guys are as funny as ever. 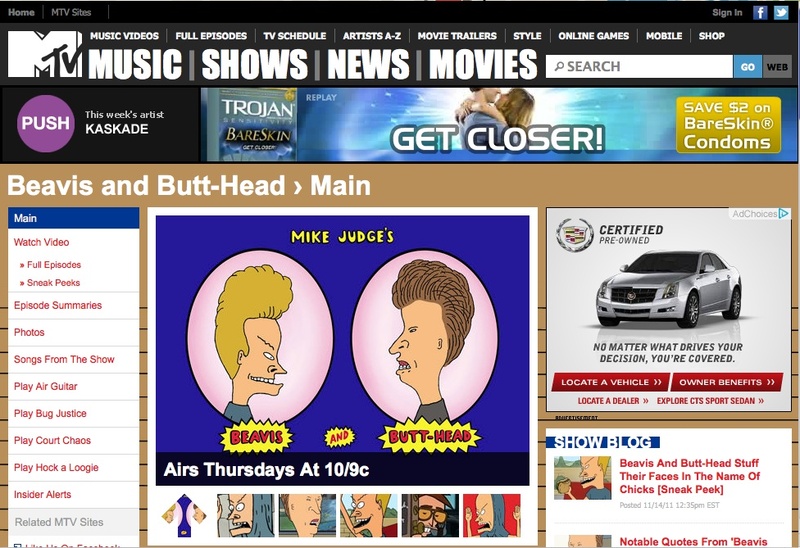 I'm also enjoying weird juxtapositions watching the show and visiting the website. 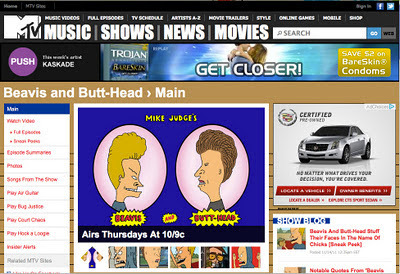 Something strange is afoot at the Circle K. Bringing Beavis and Butthead back has revealed some weird wrinkles and ruptures in the MTV audience. Consider the framegrab below, which suggests viewers of Beavis and Butthead both expected to actually have the ability to score, and be in the market for a Cadillac. The Trojan sponsorship also extends to the TV show...this is not the result of my own web surfing trail of data, in other words.